You can't help but notice the enormous popularity that Bret Michaels, lead singer of the band Poison, has generated with his "Rock of Love" series on Vh1. Not only was it the #1 ranked show for VH1 last season, but the exposure that Bret Michaels has received from it, has put him back into the spotlight. Bret Michaels has been the lead singer/ songwriter for Poison for 22 years. Michaels and his band, have sold 25 million records and scored 15 Top 40 singles. Some of their hits include "Talk Dirty to Me," "Something to Believe In," "Nothing But a Good Time" and the #1 hit "Every Rose Has its Thorn." Coupling his third installment, "Rock of Love Bus" with "Rock of Love Bus Tour", new and old fans are eager to catch a show with Lead singer of Poison, out on the road. He is promoting his solo "Rock My World", released in June 2008. 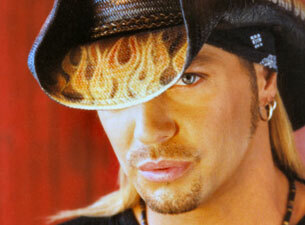 It features Bret Michaels' solo songs that have been featured on the "Rock Of Love"